Have you been dreaming of owning a second home, vacation retreat, or retirement investment in the warm Arizona desert and living the life of a high-class cowboy? Now is the time to make your dreams come true. You may be planning for your retirement and looking for an Arizona luxury real estate investment as part of your picture-perfect future, even if you’re not quite ready to call it quits on your career life just yet. The Residences at The Ritz-Carlton, Dove Mountain is a unique private community featuring luxury resort-style desert custom homes, providing an unassuming lifestyle to a discriminating clientele. Do you want to live in rustic elegance and still live nearby urban areas? Need a place to swing your golf clubs AND go horseback riding? The Residences is an upscale community that will meet all of your needs. This resort lifestyle community has custom estate home sites ranging in size from two to seven acres located in the Rockpoint Ridge enclave, some of the most picturesque real estate in Dove Mountain. With this customizable option, you have the opportunity to design the luxury desert custom home of your dreams. Additionally, the Seven Saguaros neighborhood offers custom golf home sites sized from one-half acre to one acre, overlooking the Jack Nicklaus Signature Golf Course. These custom home sites provide stunning views of the challenging course at The Residences. If you’d rather enjoy your home at The Residences at The Ritz-Carlton, Dove Mountain more quickly you can select one of several customizable floor plans, which can be finished to meet your specific wants and desires. You’ll find it easy to settle into the desert lifestyle at The Residences at The Ritz-Carlton, Dove Mountain. While enjoying your custom home, you’ll discover your surroundings are full of plants such as the Saguaro cactus, prickly pear, desert willow, Western wildflower, and cave primrose. Wildlife in the area include the great horned owl, the golden eagle, the black-chinned hummingbird, Gambel’s Quail, Hooded Orioles, and the cactus wren. There are also bobcats, coyotes, tortoise, and javelin which are sure to astound and delight. 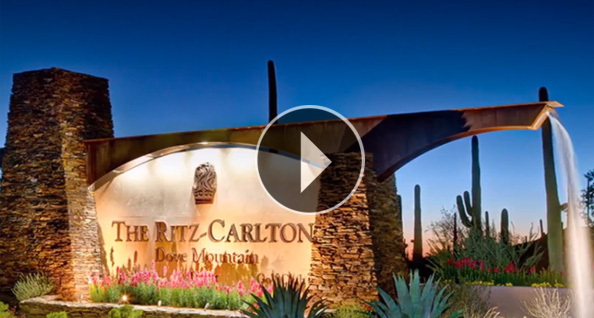 Wide open spaces and panoramic views of desert mountains and vistas come together with the finest Ritz-Carlton resort amenities in a new trend in resort style luxury Arizona real estate. The Residences at Dove Mountain have been developed with you in mind: people entering the second half of their lives, exploring life as empty nesters and ready to buy the home in which they’ve always dreamed of retiring. The luxury community features Jack Nicklaus Signature Golf Courses, gorgeous hiking, biking, and horseback riding trails, and other outdoor living options. Now you can fulfill your second-home or retirement vision, enjoying elegant desert living in your luxury Arizona home, spending your days basking in sunshine 365 days a year.